The Hana Financial Group will set up a 1 trillion won fund to provide the financial support to venture capital firms in the areas of ICT and biotech for the next three years until 2021, the financial group said on Dec. 19. 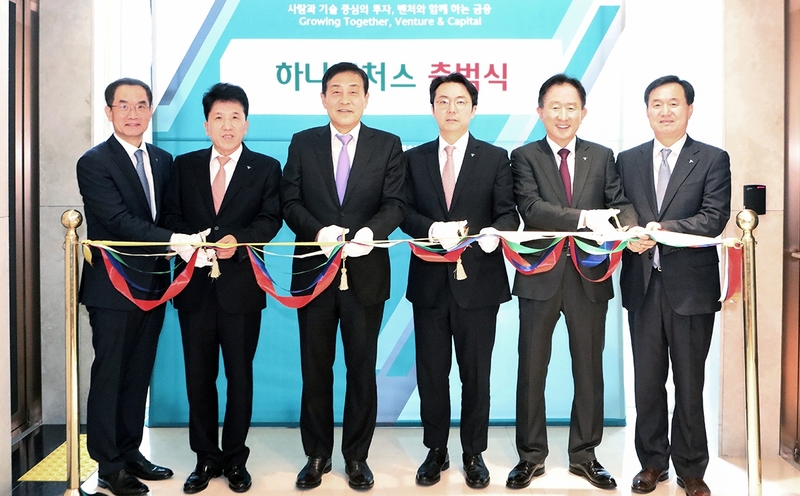 The group said it has launched the Hana Ventures as an affiliate of the Corporate Venture Capital in a ceremony held at the head office of the new venture firm located at Teheran Avenue in southern Seoul attended by a score of dignitaries of the group and its major affiliates including President Ham Young-joo of KEB-Hana Bank, and President Lee Jin-kook of Hana Financial Investment led by Chairman Kim Jung-tae of the group, totaling around 50. Hana Ventures as a financial firm dedicated to extending financial support to small and medium-sized venture firms so that they can commercialize the new technologies as well as making direct investments in those venture firms with not much limit placed on investments in comparative terms. The Hana Financial Group has become the only major financial groups in the country to have a venture firm as its affiliate dedicated to providing loans to the venture firms whose main businesses are to commercialize the new technologies. Hana Ventures plans to set up a 100 billion won 4th Industrial Revolution fund in the first quarter next year as part of the funds totaling 1 trillion won to be provided to the firms in such areas as the information communication technology(ICT), biotech, and healthcare. In addition, Kim called for Hana Ventures to take the lead in fostering venture firms into unicorn companies, which have more than 1 trillion won in corporate value. Hana Financial Group(H pledges to do its best to fulfill its corporate social responsibilities by proactively pursuing its new mission of satisfying the unique demands and changes of each era. To make society better for everyone, Hana Financial Group promises to engage in activities that foster growth for all stakeholders. This will be a “healthy growth” that aspires toward a balance of growth, the fundamental purpose of a company, and social responsibility. As it has always done, HFG will continue to be faithful to its corporate role by sharing profits with all of its stakeholders while actively participating in achieving the happiness of all members of society through the creation of shared values in finance. HFG’s new vision embodies a strong conviction to establish strong and trusting relationships with all stakeholders. To form trusting relationships, Hana Financial Group will provide its wide range of customers with long-term satisfaction, create a better work environment for its employees, and constantly engage in communication-based management activities. Due to changes in the domestic and overseas financial environments that were brought about by the dawning of the “new normal” era and accepting Korea Exchange Bank as a new member of the Hana family, Hana Financial Group needed to redefine its role and goals to match the group’s current status and potential. In light of this need, HFG has established a new vision, mission, and core value.